Collings was born into an educated family where he was exposed to the visual and performing arts. He studied art in Brisbane, Sydney and London in the 1930s and while at St Martins College of Art in London became involved in photography. He worked as a photographer with the Royal Australian Air Force during the First World War and from 1950 onwards was involved in documentary filmmaking. His photographs were published extensively in the 1940s in ‘The Home’, ‘Woman’ and the ‘Sydney Morning Herald’. He also worked as an art director at the advertising agency George Patterson in Sydney from 1955 to 1970. Collings’s photographic style was wide-ranging and he tended towards photo-documentary. His work throughout was as influenced by modernist thinking as it was by burgeoning documentary principles. 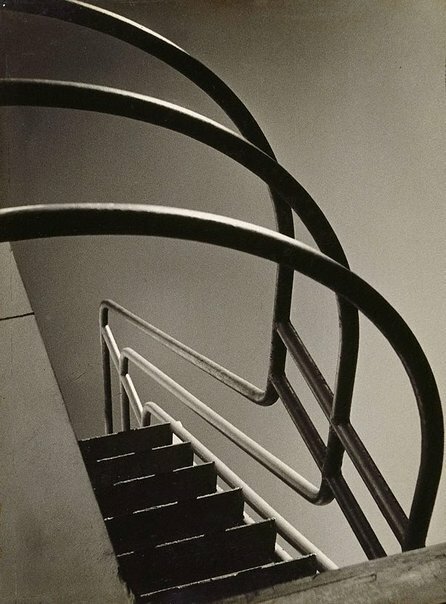 ‘Controlled repetition’, which was published in ‘Australian photography: a portfolio’ 1949, is an example of the former.1 The view of the stairs and railing from below against a flat ground is typically modernist. The curves of the tubular steel railings and flat planes of the steps are counterpoised, as are the light and dark areas. The effect is pleasing and clean and recalls Lucia Moholy’s photographs documenting Bauhaus architecture of the 1920s. That this kind of architectural photography had become an international style with considerable influence in Australia is also borne out by the architectural photography of Max Dupain.